Here's a blog post that I never thought I'd write. 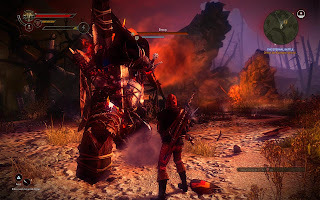 It's a blog post in defense of The Witcher 2. Recently, in my spare time and interspersed between my modding sessions, I've been taking some time to play The Witcher 2. For a long time, I had zero interest in this game, because I found its predecessor to be an utterly horrible, boring and poorly designed game. I'll still happily stand by that assessment. That said, I was convinced to play The Witcher 2 (TW2), and despite some initial concerns, I found that many of the complaints I had about the first game were gone. It was with some amusement that I read an article by Tom Bissell decrying the game and felt myself thinking "you're really not doing the game justice". Hence I thought I'd raise my thoughts in this post. So I have to say upfront that TW2 is a really good game. One of the first things I noticed was that the game had moved to a paraphrasing rather than full lines of dialogue. 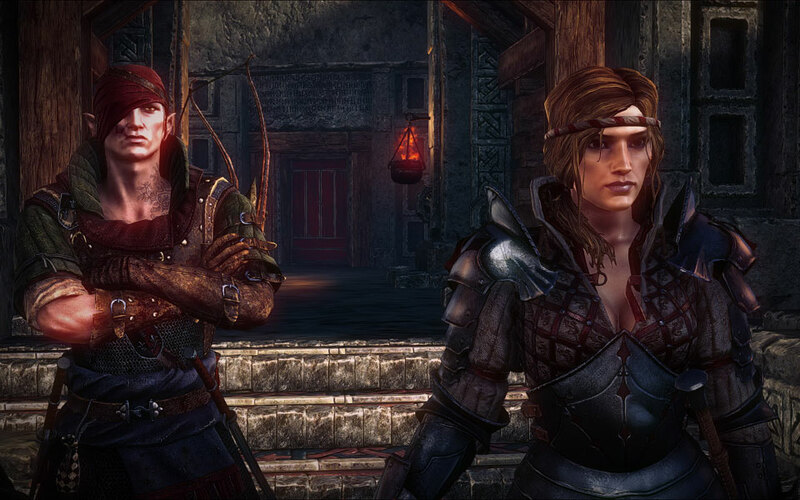 While many roleplayers hate this, in this case it's actually a vast improvement on TW1. Conversations are much cleaner and feel as though they provide better player control and allow them to slip into the role of Geralt more easily. Yes - the dialogue was actually improved by paraphrasing, because it fits better with the automatically dialogue and means that the player is told in a more palatable way that "you are roleplaying Geralt" rather than "you are roleplaying how you want". The tedious MMO quest design of the first game is gone, and the amount of backtracking to repeatedly cover the same ground and kill the same monsters over and over again is significantly reduced. The forest of Act 1 didn't present the same tedium as the swamp in TW1; which is good, because if it had, I would have quit the game. The liberal and juvenile profanity is replaced with a more mature vocabulary. The game still includes swearing, but it's no longer gratuitous and constant as it was in TW1 - words are actually chosen for effect and characterisation rather than just throwing in swearing to "make the game more mature". Furthermore, most of it makes sense, as opposed to TW1 where there had obviously been some translation issues that left you wondering exactly what was meant by a particular sentence. To address a few particular issues raised in the Grantland article: Complaining about the inventory system in an article that also mentions Skyrim is just plain ludicruous. Compared to Skyrim's system, TW2's inventory is a dream. The complaints about similarities to Tolkien are somewhat misplaced and seem to have missed the point in that their presence is primarily used to push the themes of racism running through the game (and series). Using fantasy races as a means to achieve this is a simpler means than trying to create different human racial groups (which would be fraught with issues), and is also remains true to the source material. The only time I felt the game was aping Tolkien was when it was openly and outright referencing it as part of some sort of joke. 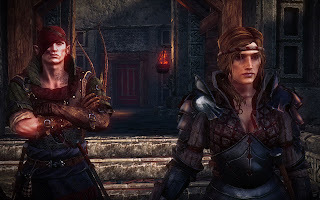 The comments about the lack of memorable dialogue is a fair one, but when you're aiming for a darker tone rather than including glib one-liners like the Dragon Age series, it could feel somewhat jarring. I agree wholeheartedly that there are few memorable lines of dialogue, but personally, that's the case for most games. There were a few lines, particularly in the second chapter following the path of Iorveth, that were hilarious. Of particular note is the way the plot plays out and the choices that the player gets to make. These are nothing short of excellent, so if this at all matters to you as a gamer, then you should be willing to overlook the shortcomings of the game to experience these. 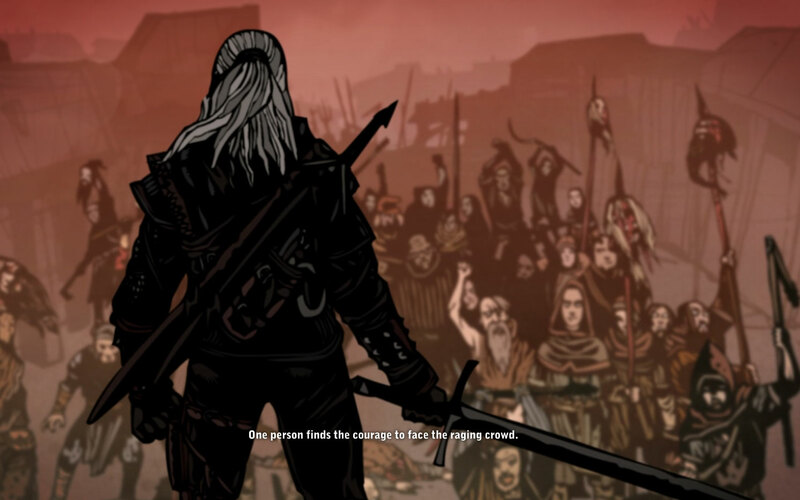 While TW1 had some reasonable options in this regard, it really felt like it bludgeoned you with the results of those with utterly fourth wall breaking vignettes that highlighted the effects of choices. TW2 does have some animated sequences that fulfil a similar role, but they delivered in a way that in consistent with some of these that are done as pure storytelling, and hence feel like they're providing additional background and context rather than highlighting the consequence of a choice in most cases. The game does put the player in some great quandaries, and in more than a few cases gives you choices where there's no "great" outcome. While this did happen in the previous game, TW1 could be significantly more depressing, making the player feel as though instead of being a hero, all they were doing was spreading more misery regardless of their choices. While TW2 certainly has its share of bleak moments, it generally lacks the feeling that made the player think "wow, I'm a complete jerk". TW2 should particularly be commended on its completely divergent second act. This act of the game plays out extremely differently based on a decision you make within the first act, which definitely offers some great replayability value. It also helps give better insight into all the characters and events of the game - getting a different perspective to help understand the motivations of the various characters involved. The short third act is both a blessing and a curse in that it allows the developers to provide a good climax and showcase the results of those choices, but does leave the player feeling as though the ending came abruptly. The epilogue that more or less has a character provide exposition for the remaining loose ends in the story is a bit weak, but it doesn't really tarnish or diminish the choices made like the ending of Mass Effect 3. Friend or foe? It's your choice. Of course, I'll concede the point that the game still isn't perfect. There are a few things TW2 gets wrong. The first is the way it handles combat. It is absolutely awful for any new players. The difficulty curve is plain stupid and gives the player no assistance whatsoever. Most players will die repeatedly and get very frustrated in the game's prologue, or if not, then almost certainly in the second act of the game. The designers simply don't have combat mechanics that gradually introduce players to the intracies of combat and how to manage it. 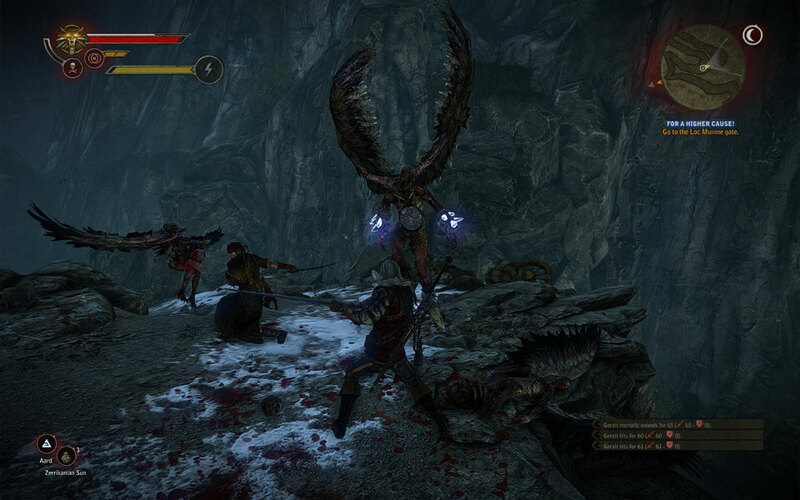 This is complicated by the fact that on the standard difficulty level, the combat really isn't that deep. Sure, at the higher difficulty levels, players have to use every damn tool at their disposal, but that's why higher difficulties are for. 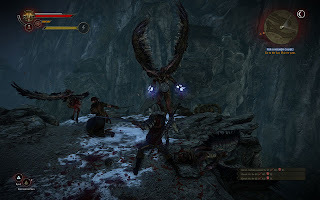 In a good combat system, there will be a variety of techniques the player can use and master, and then combine these to allow for more complex and rewarding gameplay. TW2 doesn't really have any of that. You have either light or heavy attacks, and you can dodge. That's pretty much your basic arsenal for an introductory player. Players also can use signs (read: magic), to help protect them or trap an enemy, but until you finally manage to upgrade them, they're of limited value. If the player gets hit from behind at all, they can expect their health to drop significantly. Boss monsters (the first few, at least) can kill a player in one or two hits. Potions, the way the player would prepare for major fights in TW1, can be more difficult to use in some of the major battles due to lengthy sequences beforehand, and in one case completely unusable. All that said, this combat is still dramatically more rewarding than the tedious click-timing combat from TW1, which was sheer mechanical boredom. The lore is also still delivered in a somewhat clunky manner. 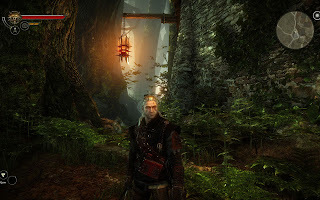 There are points where it just discusses events, places and characters as though the player knows about them, even though that information has never been provided to the player. For players of TW1, some of these will make sense, but a lot of the required lore actually exists within the books, if you don't have that, you're often standing there wondering what everyone is talking about. It's a rookie mistake from writers who don't keep track of what the player knows. The writers have in-depth and intimate knowledge of the game and the lore, which players don't necessarily have. Writers must be mindful of this, but CD Projekt Red still hasn't quite got this down yet. Again, they've definitely improved since TW2. The chief fault of the game is that the designers expect everyone to know how to play. There are virtually no tooltips, you can't reconfigure bindings, there's no easy mechanism to tell you where to go to do something or what certain icons do in interfaces. You have to know how to play in order to play, because the game certainly will never tell you. Heaven forbid that you've bought a digital version of the game, because even the Enhanced Edition available on Steam doesn't come with a manual in the download. A brief tutorial is not sufficient to tell players everything they need to know to play the game, certainly not an RPG with a raft of passive skills and statistics and numbers that come into play in the combat. Players are almost forced to look at a wiki or forums to find out the information they will probably want/need to know, which is simply not good enough. These problems aside, TW2 is still a really good game. Even if you hated TW1 as I did, it's worth your while to check out TW2. Despite some issues with the delivery and giving information to the player (both for mechanics and story telling), The Witcher 2 does have some great storytelling and plot twists and turns in it. It definitely delivers in terms of providing the player with choices and then delivering varying consequences based upon those choices. I would recommend it to anyone who likes RPGs, particularly those who enjoy choice and consequence in their games.